Over the Christmas Break, we visited relatives in the small village of Comox, on the east coast of Vancouver Island. If you like your winter days bright, cold and snowy, then Comox is the wrong place to spend Christmas — December there is cool and overcast, and the stuff falling from the sky is usually misty rain. On the plus side, golf courses are open year round. The day after we arrived, I was shopping for locally produced beer when I came across several made by Townsite Brewing of Powell River. I had not heard of Townsite before, so I looked up their website when I got home. As it turns out, the town of Powell River is on the mainland coast directly opposite from Comox; the two communities are connected by a small ferry that traverses the 26 km of Georgia Strait several times a day. Furthermore, Townsite conducts a tour of the brewery each Saturday at 3 p.m. So it was, friends, that the next day I found myself standing on the dock at Powell River watching the ferry disappear back into the mist. Okay, to be absolutely accurate, although I might have been on a dock, I was not exactly at Powell River. It turns out that for one reason or another, the ferry dock was built about five kilometres outside of town. For someone in a car, five kilometres is a 5-minute drive. For someone on foot — like me — the five kilometres represents a one-hour hike. Luckily I had come dressed for a typical cool winter day on the B.C. coast: a sweater, Goretex rain pants, and a Goretex rain coat with a zip-in liner. (Outerwear made with Goretex or some other waterproof-breathable fabric is to British Columbia what sunscreen is to Jamaica.) So I set off down the highway towards town. Most of the rugged coast of B.C. emerges from the Pacific waters at a steep angle and immediately starts to gain altitude. So any road on or near the coast has some stiff climbs. The weather might have been cool — about 8°C — but pretty soon, I was puffing (and steaming) like Thomas the Tank Engine. At Kilometre 1, my Goretex rain pants went into my backpack. At Kilometre 2, my sweater followed. At Kilometre 3, I removed the liner of my coat. At Kilometre 4, I fully opened the ventilation zippers of my coat. By the time I descended into Powell River, I was down to my sweat-soaked t-shirt. Had the walk been any longer, I might have staggered into town in my underwear. Despite my sorry physical state, I couldn’t help but admire the well-maintained Arts & Crafts houses lining the main street, an immediate reminder of Powell River’s recent history. For centuries, a fishing village inhabited by the Tla’Amin, a Coastal Salish First Nation, had stood by the mouth of the Teesquot (“Big River”). But when B.C. joined the Canadian confederation in 1871, the new government set out to modernize the province; within a few years, a government official named Powell visited the Teesquot area and gave the river a properly modern English name — his own. By 1910, the Tla’Amin village had disappeared, replaced by a huge pulp and paper mill that needed all the fresh cool water the Powell River could provide. 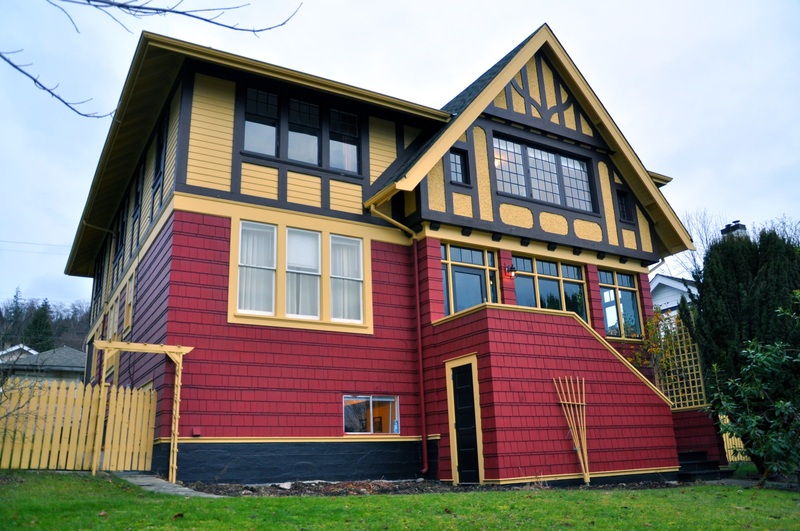 Typical Arts & Crafts style home in original Powell River Townsite. In order to attract workers to the isolated mill, the owners constructed the Powell River Townsite, one of the first planned milltown communities in Canada. On a gridiron pattern of streets, they built an entire town of standardized Arts & Crafts houses that also included parks, sports facilities, a golf course, a hotel, an apartment block, a boarding house, a hospital, churches, a community centre, a bank, a movie theatre, and a company store. During the first half of the twentieth century, the mill continued to expand; by the time it reached its peak in 1973, it was the largest pulp & paper operation in the world, with over 2300 employees. However, changes to the global economy and larger and more efficient mills in other countries led to economic stagnation. 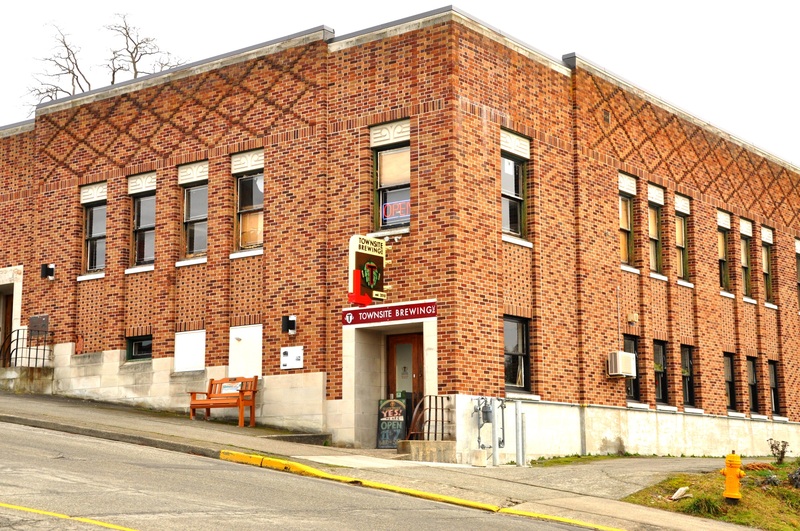 Today, although the pulp and paper mill still operates, its output is considerably reduced, and Powell River — “Pow Town” to the locals — is a pretty quiet place. Alas, even after the one-hour hike, I was still hours too early for the brewery tour, so I retired to a nearby restaurant for a spot of lunch and a glass of Townsite Brewery’s Tin Hat IPA. (“Tin hat” refers to the steel safety helmets worn by millworkers.) Tin Hat has the characteristic pine nose of a northwestern IPA, and a sharp but not overwhelming citrus bite that balanced a nice touch of caramel. Add a plate of fish tacos and it was a very tasty way to spend an hour. With lunch finished, I crossed the street to Townsite Brewery, situated just up the road from the steam-wreathed paper mill, on the ground floor of the former town post office. Entering, I discovered that I was the only visitor. Unless more tourists arrived, this was going to be a pretty short and personal tour. However, I still had an hour to go before the tour started; luckily the young woman in the tasting room offered to let me sample everything they had on tap. And for a small brewery, they had quite a bit on tap. The first thing I had to understand was that even in this modern age, Powell River remains relatively isolated. Although as the crow flies, Pow Town is only 170 kilometres from the bright lights of Vancouver, driving there requires a long and winding drive through some rocky terrain, a steep descent to a ferry dock, a ferry ride across an ocean inlet, another twisty turny drive through the mountains, another ferry ride across a second ocean inlet, and more driving through the mountains. If you don’t miss your ferry connections, that 170 kilometres takes six hours to traverse. With geography finished, it was time for history. Enter Karen Skadsheim, a native of Vancouver who had been working in Europe for a few years. Upon her return to Canada, she stayed with her brother in Powell River while she looked for a job in Vancouver. But the longer she stayed in Pow Town, the more she liked it. 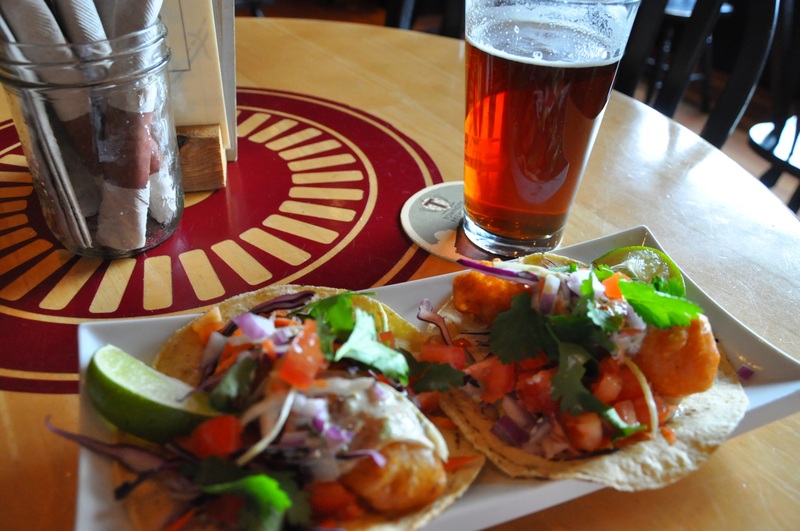 And as a native Vancouverite who had grown up with craft beer, she soon realized there was a large hole in Powell River’s economic output, at least as far as she was concerned: there was no local brewery. She drew up a plan for a small brewery. Now all she needed was a brewer. Karen’s ad for a brewer ended up attracting the attention of Cedric Dauchot, a Belgian brewer who was living in Saskatoon, of all places. Cedric, trained as a brewer in his native Belgium, had been working in Montreal for Les Trois Brasseurs when he met Chloe Smith, who was also a brewer. They ended up getting married and moving to Smith’s home province of Saskatchewan to open a brewery. Unfortunately that venture failed, which gave Cedric and Chloe the opportunity to move to Powell River. Which is why I was tasting Belgian ales in B.C. Time to move on to the 7800 Saison — so named because Powell River is exactly 7800 kilometres from Cedric’s hometown in Belgium. With its spicy coriander nose and fuller body, this saison would be a perfect match for heartier dinner fare. 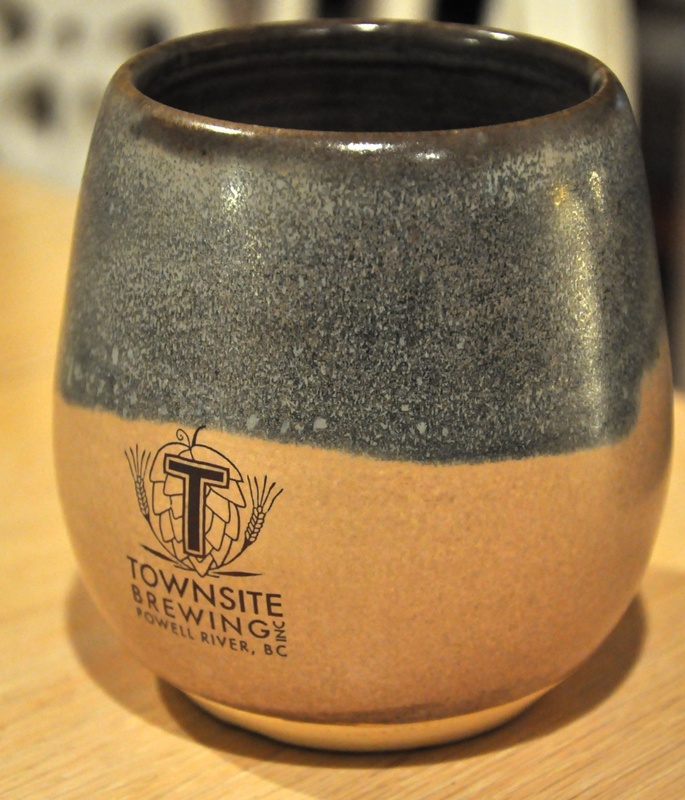 Townsite has been open for a year and a half, which has given Cedric enough time to expand his repertoire of beers to include a west coast-style IPA. Although I had just finished a glass of Tin Hat IPA not half an hour before, I was only too happy to taste it again. It is often said that no B.C. brewery can survive without an IPA; I don’t know if this is true, but I am sure glad to see Tin Hat on Townsite’s list of offerings. This is definitely not a Belgian style, but Cedric’s deft use of northwest hops to produce that juicy citrus tang demonstrates he understands the local beer scene. Pow Town Porter is the brewery’s award winner, having picked up a gold medal at the BC Beer Awards in 2012, and a silver medal last year. It has a very approachable nose of bitter chocolate and coffee, a medium body despite its 5.5% abv, a nice toasty breadiness, and a roasty finish. Bière d’Hiver (French for Winter Ale) is their current seasonal and another award winner, taking a bronze at the BC Beer Awards in 2013. This rich winter warmer has a nose of raisins, coriander and a hint of tropical fruit, a taste of plums and brown sugar — apparently Cedric hand-makes 60 kg of candi sugar to add to the kettle — and a warming caramel booziness in the finish. As I finished my final sample, I looked around and to my surprise, the place had filled up with visitors waiting for the tour. Holy smokes, there must have been twenty people. Where had they all come from? Most of them knew about the tour and had arrived right at 3 p.m. However, I chatted with one couple who had just been driving by and had dropped in on a whim — they didn’t believe me when I told them this was the only tour of the week. Finally the magic hour of 3 p.m. arrived. 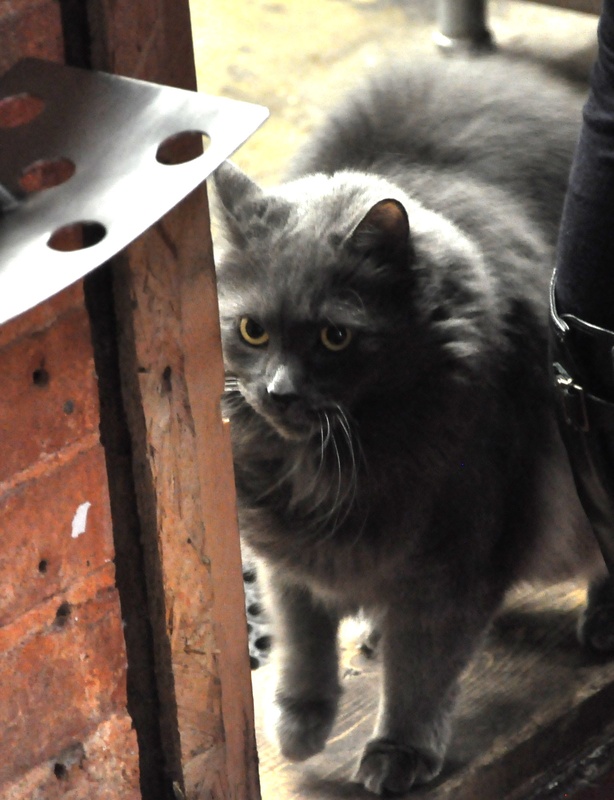 A cheery young woman with a New Zealand accent greeted us and led us into the back of the brewery to start the tour, accompanied by the brewery’s vermin destroyer, Mr. Twinkletoes. 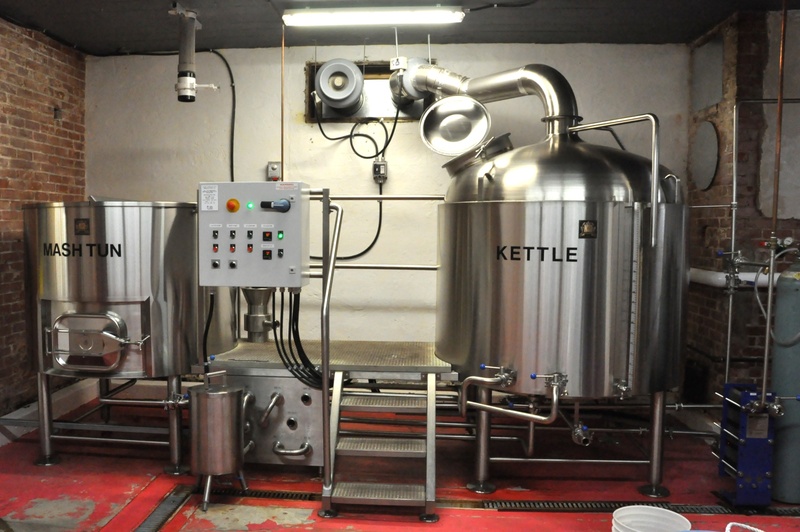 Our first stop was the brewhouse, a standard two-vessel design (mash/lauter and kettle/whirlpool). I was interested to see a small filter on the floor beside the mash/lauter tun. Its purpose, explained out guide, was to help remove bits of grain that managed to get through the lauter screen. The system looked to be about 5 hL, but our tour guide wasn’t sure, although she did state that Cedric brews twice a week and produces about 24 hL per month. Even with the low profile, it is still a bit of a tight squeeze between floor and ceiling once pipes and valves have been installed. Right across the aisle from the brewhouse are three fermentors. There being not much call for 20-foot ceilings in a post office, the fermentors are low and squat, with side-mounted manways in order to fit under the office-height ceilings. Once fermented and matured, the beer is run through a plate-and-frame filter for clarification and then on to a couple of bright tanks to await bottling. The packaging line was interesting. Like Black Oak in Etobicoke, Townsite uses a compressed-air driven 6-head Meheen filler to fill and cap 650-mL bombers, and a labeller to apply labels. Unlike Black Oak — and just about every other brewery I have seen — Townsite labels the empty bottles first, then fills them. Huh. 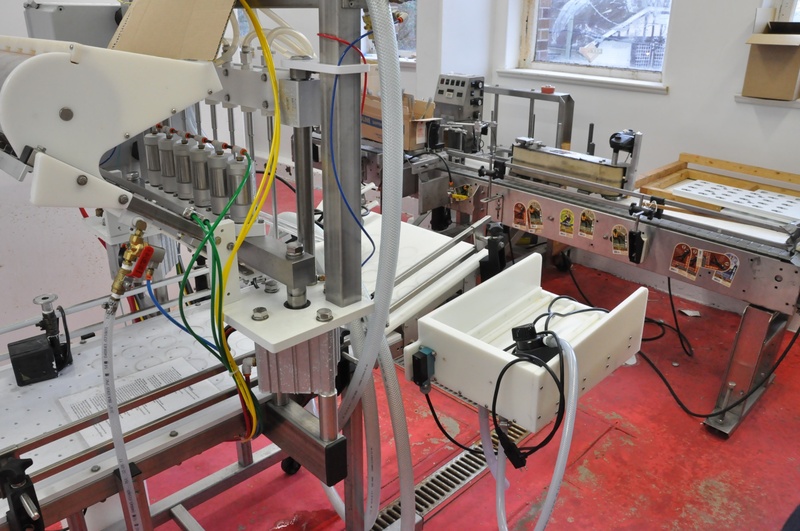 It was also interesting that the bottling line and filling line are not connected by a conveyor belt, although this may be due to a lack of space. The 6-head Meheen filler (foreground) and the labeller (against the wall). 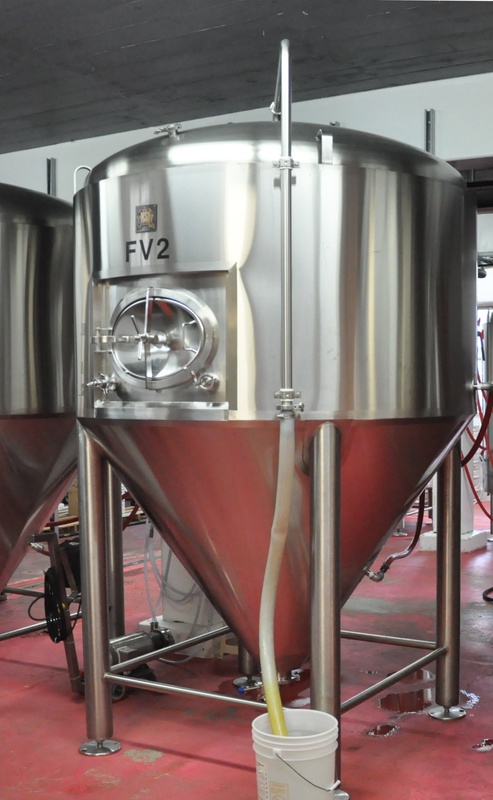 Unlike other breweries, the two are not connected by a converyor belt. That was the end of the tour, so time to retire back to the tasting lounge. Those people who had arrived just before the tour started could taste some samples.Those that had already tasted the samples — like me — were free to browse through the logo swag that was for sale. 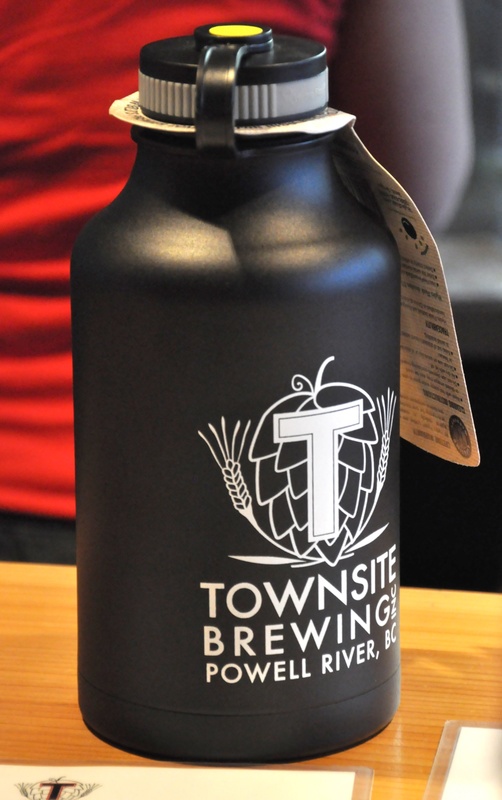 Townsite sells growlers — as I’ve mentioned before, B.C. is one of those wonderful jurisdictions where you can bring in your own growler to get refilled. It was interesting to see that in addition to the standard glass growlers, Townsite also sells Hydr0Flask steel vacuum insulated growlers for about $50 — yes, the very same flasks I reviewed some months ago. Tumbler. Flagon. Goblet. Definitely not a glass. And what would a trip to a brewery be without picking up a little souvenir? Sometimes I pick up a hat or maybe a t-shirt, but of course, never a beer glass — Elaine has mentioned my burgeoning beer glass collection. I did see something a little unique and decided it would fit into a suitcase for the flight home. Well, it’s not exactly a “glass”, is it? And then, it was time to make the one-hour hike back to the ferry terminal — the ferry was scheduled to leave in just over an hour, and 26 km across the Georgia Strait, my dinner awaited. This entry was posted on January 12, 2014 at 10:23 pm and is filed under Brewery. You can subscribe via RSS 2.0 feed to this post's comments. Spent many days enjoying Powell River about 15 years ago or so. My sister lived there with her family and we went to visit. Too bad the brewery wasn’t there when we were! I’m sure the town hasn’t changed at all in the past 15 years (other than the post office is now a brewery). Really enjoyed your post. These people made a great recovery for the old post office. Should have taken the willingdon trail. Shorter and more scenic walk. If you come again I’ll give you a ride ;). Great write up. You know, I don’t go out a ton, I don’t wear my gortex shell much. After a little bit you just get used to the drizzle. It rarely rains much out here, by Ontario standards. It just kind of spits at you; you can walk in it for a good long while without your cloths even feeling wet. I do remember having to wait a long time for you to get home for dinner that night. Look on the bright side; you probably burned off all the calories from that beer on the walk.